Turns out I’ve been featured in ‘The Drum’ magazine. Which would be nice, except that I wasn’t made aware it would be happening. 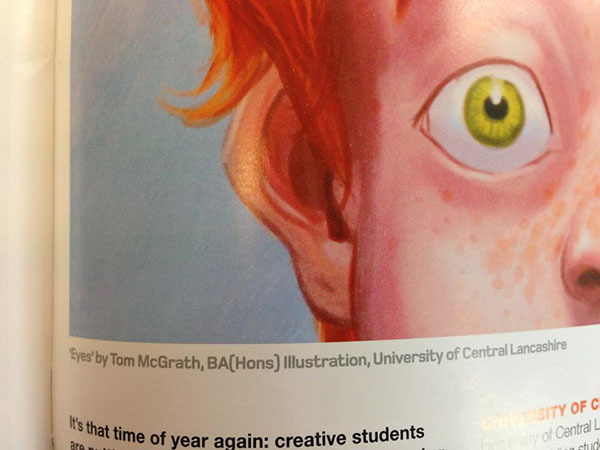 My “uh oh” illustration is included in article which I feel is quite clearly an advert for my old university- a university which I have no desire to promote for free. After a short exchange of emails it’s emerged that The University of Central Lancashire apparently retains unconditional rights to use any and all work that I produced while I was there. A right they are now exercising for marketing purposes This isn’t something I was aware of, but it doesn’t surprise me, I expect there is some clause somewhere I once signed when I enrolled. I wonder how many students are aware that their old Unis retain the rights to their work? Given that I probably have no legal leg to stand on (which always bloody happens.) and therefore both Uclan and The Drum can happily use my work for their own profit, I feel that all I can really do is to express my personal opinion here instead in the hope that anyone who reads the article and googles my name is left in no doubt. I do not endorse the University of Central Lancashire in any way. I should make clear that have no desire to offend my old tutors, I have great respect for some of them, but I simply cannot recommend Uclan on the basis of my time there, and I resent my work being used to do so when I have expressed an explicit wish to the contrary. It seems ironic to me that a university that claims to give students such a good start in their careers will then go on to undermine them in such a way. I make (barely) a living from producing and selling the rights to use my artwork, Uclan giving away the right to use my work in magazines produced for profit is not something I consider particularly supportive. It could be argued perhaps that I ought to value the promotion, but I feel that in the context of the article- which includes only my name next to that of the university and then goes on to extensively detail the wonderful benefits of university education- the prime beneficiary of any promotion is Uclan. Any promotion I do achieve I’d rather forgo given the context. Also, why do they always get the title of the piece wrong?